At the Second Literary Translators’ Congress in Moscow, translators of Russian literature from the UK, France, Italy and Spain were awarded prizes by the Russian Institute of Translation. Elsworth’s translation of Andrei Bely’s novel has been released in limited circulation by the publishing house Pushkin Press. “Bely is never going to be a popular writer,” Elsworth told an RBTH correspondent. “Anyone who has studied his works will tell you this. Interestingly, though, most people know that in the 1960s Nabokov named Bely’s “Petersburg” one of the greatest works of the twentieth century. English readers know about Nabokov’s quote, but they are not familiar with the novel itself. And the previous translations were clearly not convincing enough to attract a wide circle of readers– or even a small circle for that matter. So I thought I’d give it another try,” said Elsworth. In the poetry category, the prize went to Alessandro Niero of Italy. He entered his translation of “Thirty-Three Texts”, which has been published by Terra Firma. “Thirty-Three Texts” was originally written by one of the founders of Moscow conceptualism, poet and artist Dmitry Prigov. Niero is also the author of an anthology titled “Eight Russian Poets”, which won the State Translation Prize from Italy’s Ministry of Culture and Cultural Heritage in 2006, as well as the and Lerici Pea Prize for translation and popularization of contemporary Russian poetry in 2008. Alessandro Niero currently teaches Russian literature at Bologna University in Italy. The best translator in the contemporary Russian literature category was Hélène Henry-Safierof France, who won a prize for her translation of Dmitry Bykov’s novel “Pasternak”, published by Fayard. Hélène Henry-Safier teaches history of Russian poetry at Paris-Sorbonne University, where she holds seminars on the theory and practice of literary translation. She has studied and translated Russian 20th century poetry extensively, specializing in poets such as Pasternak, Mandelstam, Annensky, Nabokov, Akhmatova, as well as Brodsky, Rubenstein and Shvarts. She received an Order of Art and Literature in 2005. The category for translations of 19th century Russian literature was, arguably, where the competition was fiercest. This year the prize was won by Spanish translator Victor Gallego Ballestero for his new translation of Tolstoy’s “Anna Karenina”, published by Alba. Victor Gallego Ballestero graduated from the A.S. Pushkin State Institute of Russian Language Studies and specializes in Russian literature of the 19th Century. He has introduced Spanish readers to fresh translations of short stories from Chekhov and Tolstoy, Pushkin’s poems, Turgenev’s novellas, Dostoevsky’s “Diary of a Writer”, and “Mirgorod” and “The Overcoat” by Gogol. Ballestero dedicated the past two years of his life to his translation of “Anna Karenina”. This year, each of the winning translators received a competition medal, a diploma and $6,400 cash prize. Furthermore, the publishing houses that released the winners’ translations will receive grants of $3,800, to be put towards translating other works of Russian literature. New titles will be elected for translation with the help of the Institute of Translation, a non-profit organization that works under the auspices of the Russian Federal Agency for Press and Mass Communications. It was Mikhail Seslavinsky, the head of this agency, who presented Victor Gallego Ballestero with the prize for his translation of “Anna Karenina”. 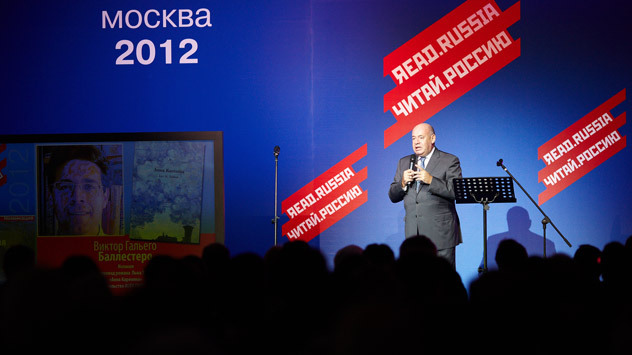 In a short speech, Seslavinsky said that his job entailed a “constant battle with the Ministry of Finance.” He joked that the Ministry of Finance should build fewer tanks and use the money to finance more literary projects, instead.